Roma Luxury wants to give you some insider’s tips on the musts to see in Rome if you have just a few days to spend in town and you want to live a highly romantic Baroque experience. Choose one of our exclusive tours and for an unforgettable experience! Rome, ancient ruins of pagan temples and early Christian places of worship stand next to Renaissance palazzos and Baroque fountains. The Eternal City is a place which lives life as a form of theatre and where love and power are the two main elements that shaped this 3000-year-old city. There are so much things to do and see in Rome. 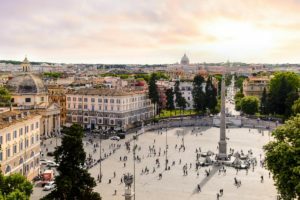 Today Roma Luxury wants to suggest you some places that will flabbergast your eyes, mind, and heart … these are the 5 MUST visit in Rome. 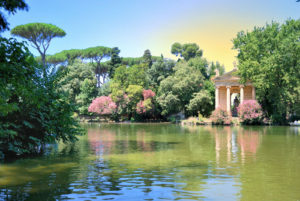 Borghese Gallery and Borghese Garden: Visit one of the world’s finest art galleries. The Galleria Borghese, immersed in one of the most beautiful green area with a breathtaking overview on Rome, was built in the early 17th century by Cardinal Scipione Borghese to house his wonderful collection of art, both ancient and modern. 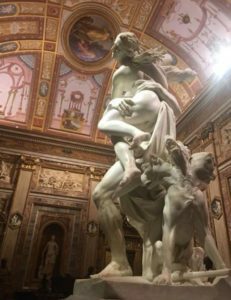 You will lose yourself admiring every work of art inside the museum and your heart will fall apart when you will make eye contact with one of the greatest masterpiece of Bernini: Apollo and Dafne. You will also see a gaggle of Caravaggios in Room VIII. The gallery is filled with an impressive selection of Italian masterpieces: Raphael, Titian, and much more. The Villa Borghese park is home of the stunning Galleria Borghese museum (also other museums); a zoo, a romantic Baroque swan lake with paddle boats; chic cafe’s; an ancient childrens carousel; and lots of lakes, fountains, statues and unique composition of trees, greenery and atmospheres studied for the pleasures and delight of the Borghese family and parties . Gianicolo: Rome is blessed with a number of parks and green space. 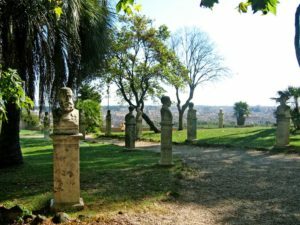 You won’t find these parks (or trees or benches for that matter) in the historic center of Rome, where all the major sites are. But they are all around Rome and very accessible, even by foot. The Gianicolo (Janiculum) hill is without a doubt one of the best places to have a panoramic vista of Rome. You see almost the entire center of Rome, with many monuments clearly visible, spread out in front of you. But also, to the back, you also get bonus views of St Peters dome. This is where the locals go to escape the crowds in Rome. It’s green, shady, peaceful and quiet and you can still enjoy a slice of Rome life by taking a stroll down the hill to the other side, towards the quiet back streets of Trastevere. The Pincio is another wonderful spot in Rome not to miss in Rome for its breathtaking view over the eternal city. Above the trees, you can gaze down at the historic center and across towards the Vatican. The Pincio terrace sits directly above Piazza del Popolo, at the end of Via del Corso. Try to arrive around sunset, when the view is by far the most stunning. 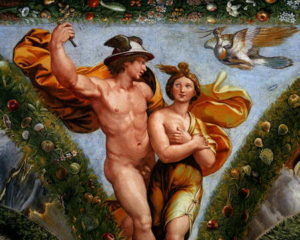 Villa Farnesina A place full of romantic and colorful paintings designed by Raffaello Sanzio. Raphael was a very amorous person, fascinated by the feminine attraction, and always ready to serve them; in the pursuit of his carnal pleasures. When his friend Agostino Chigi commissioned him to paint the first loggia in his palace, Raffaello was not able to give much attention to his work, his thought were towards the woman of his heart in that moment; so Agostino organized so that this lady should come to live and constantly be with Raffaello in that part of the house where he was working; and in this way the work was brought to completion, and with such a romantic transportation, for Rafaello tried to seduce the woman of his desires in every stroke. For this, the workmanship in these designs represents so intensely the game of how love has its omnipower on one’s psychic torments and ecstasies. 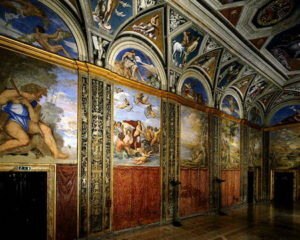 The magnificent ceiling he made of the Council of the Gods in Heaven, wherein, in the forms of the Gods, are seen many vestments and lineaments copied from the antique, and executed with very beautiful grace and illustrating how the Gods loved to play with the mortals and their sentiments. In the same manner, he represented the Marriage of Psyche, with ministers serving Jove, and the Graces scattering flowers over the table. In the spandrels of the vaults he executed many of these intense storytelling scenes of how when love and your passion comes near than something or some mystical perverse game pulls your desired away, in one of which is Mercury with his flute, who, as he flies, has all the appearance of descending from Heaven; and in another is Jove with an air of celestial dignity, kissing Ganymede; and in another, likewise, lower down, is the Car of Venus, and the Graces, with Mercury, drawing Psyche up to Heaven; with many other scenes from the poets in the other spandrels. This is one of those must see up close things in Rome, where many have left feeling more in love and full of desire than ever to finally hold tight in your arms your loved one. A great place to fall in love and make wedding proposals, or just to contemplate how love is so powerful and intense then as now and in any time and at any and every dimension.